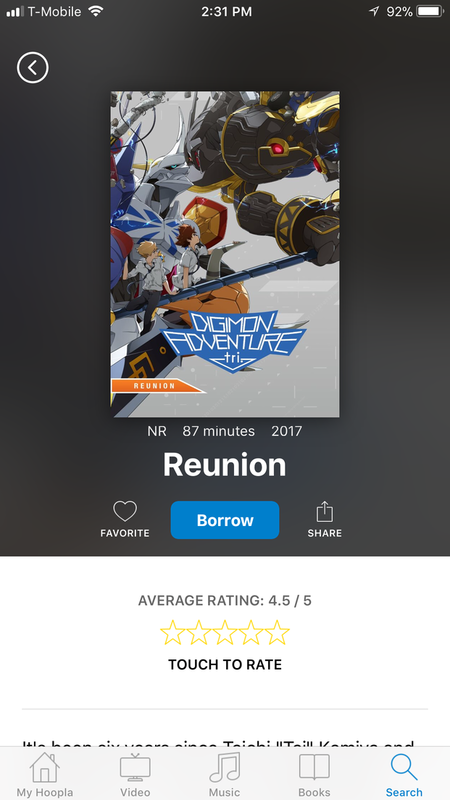 Another way to watch Digimon Adventure tri.! Parts 1 and 2 may have been there previously, we aren't sure, but 3 is definitely new since it only came out a week ago. Despite some odd onscreen titling, all 3 will show up if you search for Digimon the service. It's been added via hoopla's deal with Cinedigm, who helps distribute Shout! titles digitally. 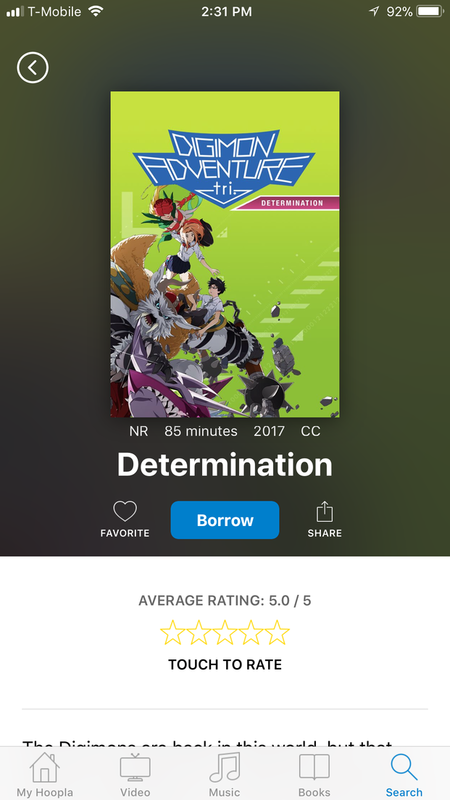 Once signed up with hoopla you are allowed to check out (borrow) a certain amount of content each month, based on the deal your library has with hoopla. For example, my library allows 7 items a month, while our good friend Victor's local library lets him have 10. Each Part of tri. allows you to watch it for 72 hours once it's checked out on the range of hoopla apps including, but not limited to: iPhone, Apple TV, Android, and Roku. 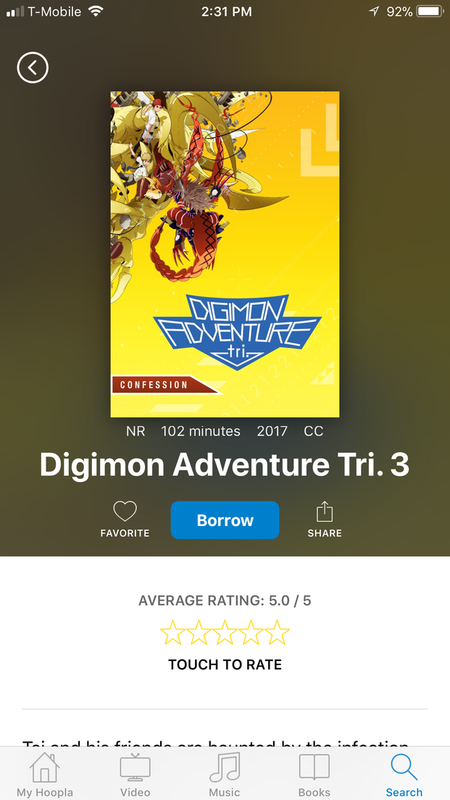 At the moment hoopla also has the (abridged, missing the hidden tracks) version of the Digimon the Movie soundtrack, along with Season 2 of Digimon Fusion. Thanks to RaidenReigns for the info. Huh, that's neat. Hoopla's getting better, they used to be pretty meager in terms of offering. My library uses it. So any idea if Hoopla operates in India? It'd be neat to watch Part 3 while I wait for my DVD to arrive. I'd expect you'd have to go to your local library and find out what if any digital services they are affiliated with. Even if it's hoopla, I'd expect the catalog to be wildly different as the distribution agreement with Cinedigm would very likely not include India. Ah, makes sense. Thanks. Guess I'll just have to wait a bit longer before I too hop on the hype train. I never had reason to go to the library so I didn't know what this is but this is interesting.